I found all the parts to the half hexagon sampler I started a few years ago and thought I’d spread them out to see what it looks like.There’s no rhyme or reason to the fabrics or colours other than they are from my scrap bins and 2 1/2 inch strip bin. The braid is probably going to be a border of some sort. There are going to be triangles of a light neutral in between each pieced hexagon. I have yet to determine what will be in between the rows. It will be laid out in rows as it is in the photo with something in between each row. Any ideas or suggestions for what to put between the rows would be gratefully received. Maybe once I have some of the pieced hexagons together with their triangles I’ll have a better idea of what to do. It’s not like I have to decide in the next day or two.. In the meantime, it is now all packed up back in its project box and it’s time to work on the next time slot project which is my Willyne Hammerstein Battle of the Stars. I have one of the partial rosettes that circle around the centre finished and fabric for another one cut. I need 10 of these in colours that complement the complete one. I think I have what I need in my stash already. All I have to do is dig for it. (grin). I think the background is going to be a dark blue. 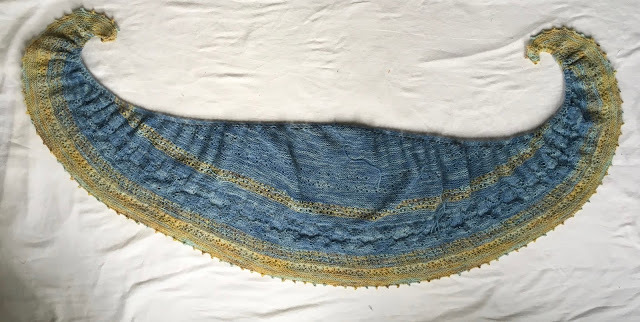 And lastly, I finished knitting on a shawl last week. It still needs to be blocked and stretched out to its proper shape. It’s made out of a lovely soft alpaca yarn that will be wonderfully warm and soft wrapped around the neck in the cold arctic vortex weather. It is super bowl sunday, and since I am not a football fan I’ll be sitting in my comfy recliner away from the TV set, either listening to a book or watching something on the computer and keeping my hands happily occupied by stitching. I’m going to do at least one more of the rosettes and then maybe some more knitting. I’m linking up to Kathy’s Slow Sunday Stitching. Your design wall looks so colourful and pretty. 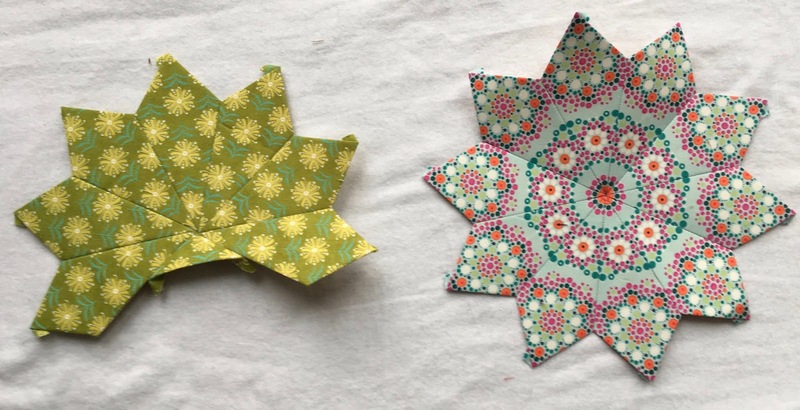 Love your EPP pretties. 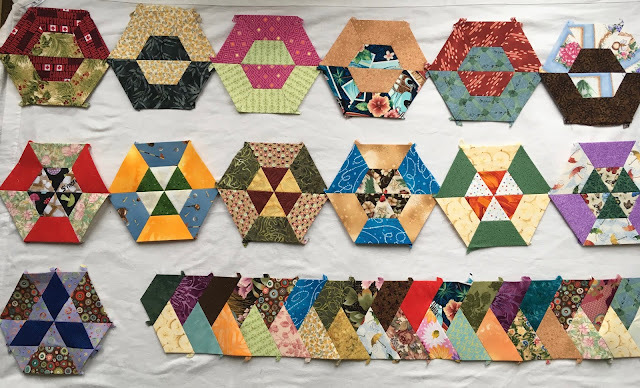 The half hexagons look lovely in all those scrap fabrics and as for your Battle of the Stars they are fabulous. The shawl looks so soft; pretty colours. You certainly look like you are enjoying all your projects. Lovely scarf. I stitched during the game, and stopped to watch the commercials. I remember those half hexxies... Glad to see that you have a plan for carrying on with that project. Love the rosettes! That shawl is beautiful! Hoping we don't have too much more "polar vortex" weather, but I'm sure that it will come in handy at other times too. Love your hexagons and your star. I am thinking of green background for the hexagons.